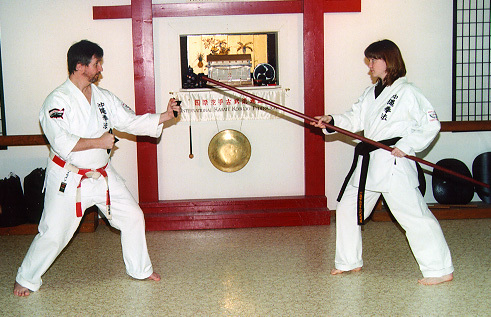 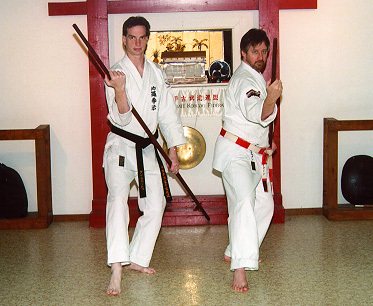 The following photos are taken from old article of Mr. Heilman's, "There Are No Stances In Kobudo" which is presented as the Feature Article of the Quarter - 2nd Quarter, 1999. 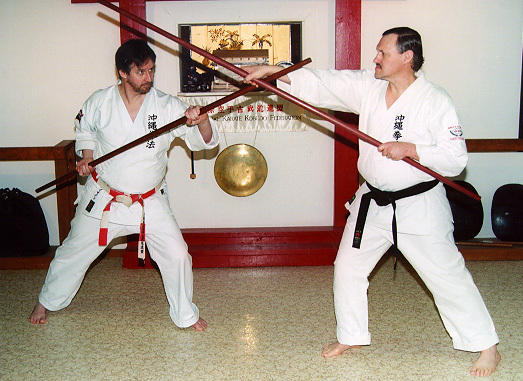 The article was published in both the States, Italy and Spain, and dates back from Mr. Heilman's "kyoshi" days. 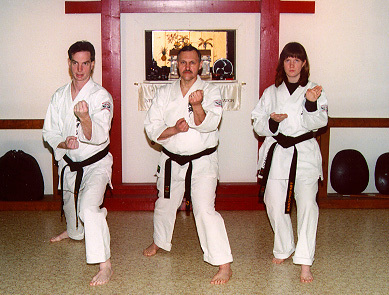 Karate Stances - Typical Karate stances of Zen Kutsu Dachi, Seisan Dachi and Neko Ashi Dachi. 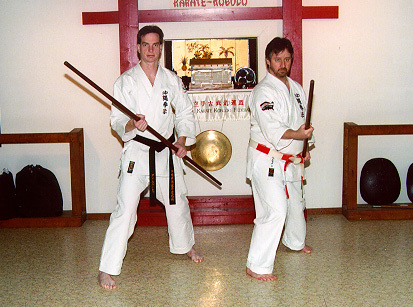 Karate vs. Kobudo Stances - This photo demonstrates relaxed on-guard positions with the bo. 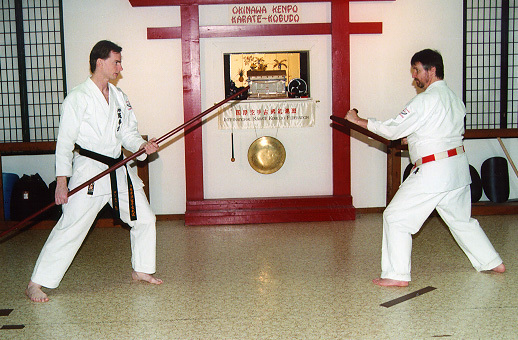 The standard Karate stance (left) results in bo not controlling centerline. 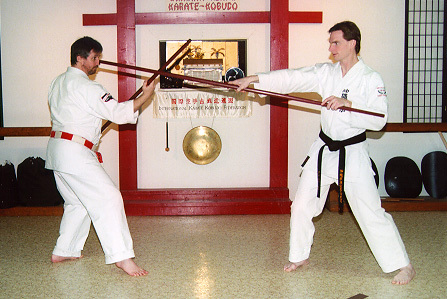 Adjusted narrower stancing (right) permits natural control of centerline with the bo. 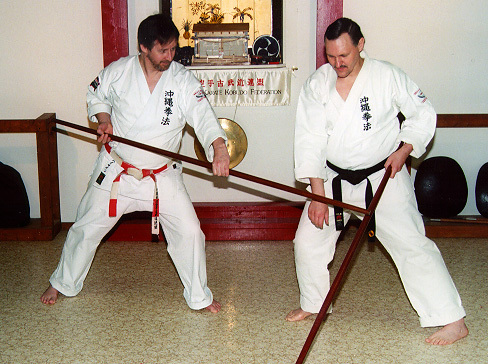 Stance adjustments for range of weapon - This photo shown stance adjustments necessary to permit control of centerline in guard positions for long to short range weapons (left to right). 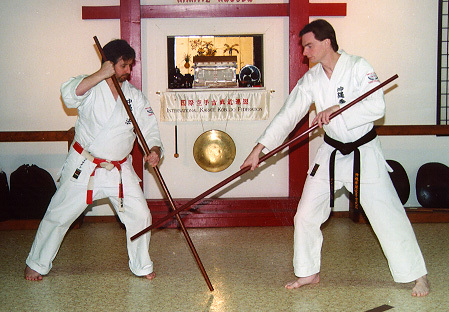 Note the longer range weapon, the narrower the stance. 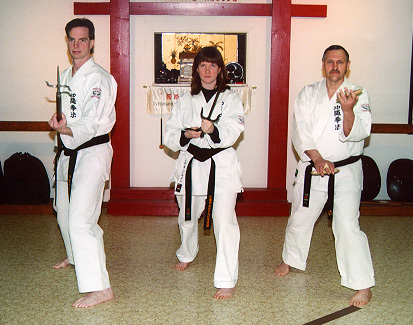 Neko Ashi Dachi adjustments for bo - Typical Karate Cat Stance is shown at left (rear foot at 45 degree with obi in half front facing position) results in lack of centerline control. 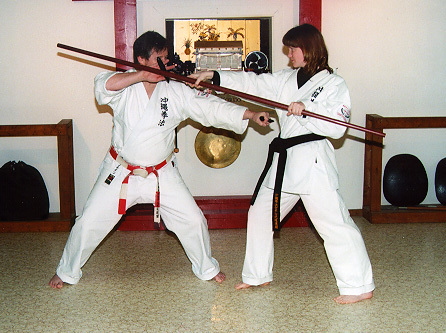 Adjusted Cat Stance for bo is basically a "back stance" rear foot and hip position which permits centerline control. 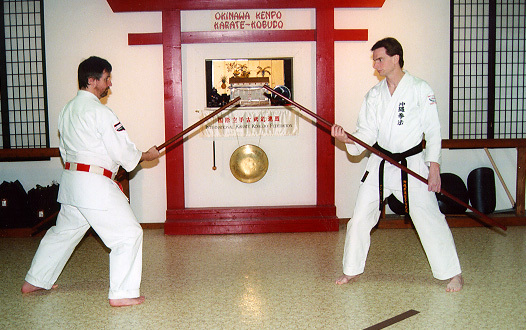 Removal of Target to Back - Bo vs. Bo: 1) Opponents square off, 2) Renshi Rupert attacks with leg thrust, Kyoshi Heilman shifts back and to the outside angle and blocks thrust, placing him in an excellent position to counterattack. 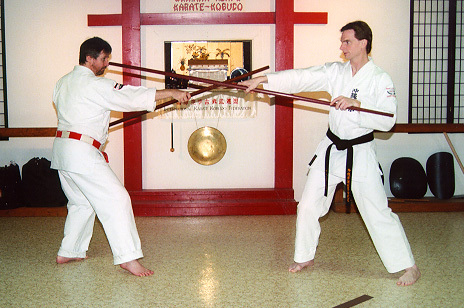 Removal of Target to Side - Bo vs. Bo: 1) Opponents in ready position, 2) Opponent thrusts to face, Kyoshi Heilman shifts sideways into Cat Stance and executes inside block, 3) Block is followed by short rotation of the wrist to strike opponents lead hand, 4( resulting in a disarm. 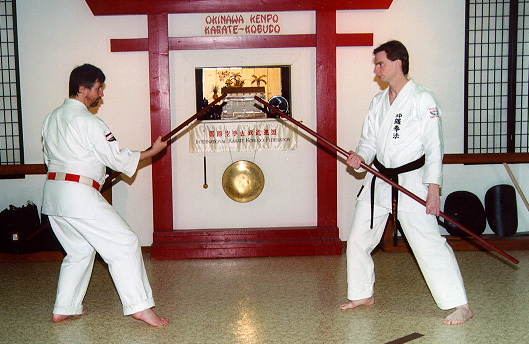 Removal of Target to Front - Tunfa vs. Bo: 1) Opponents square off, Kyoshi Heilman at disadvantage due to longer range of opponents weapon, 2) Renshi Rupert steps forward with overhead bo attack. 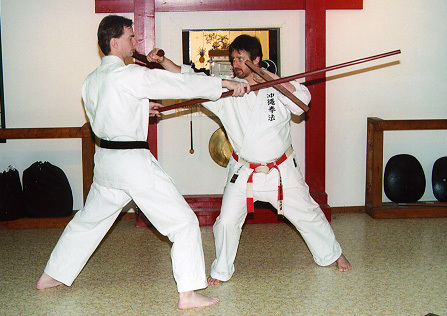 Kyoshi Heilman shifts forward and executes combination block and strike while moving inside striking range of opponents bo (and into effective range for the tunfa). 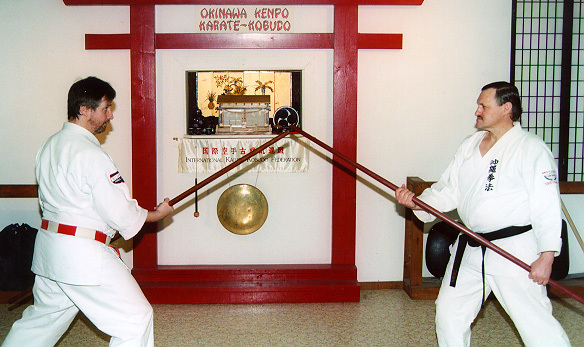 Removal of Target - Tekkos vs. Bo: 1) Mrs. Apsokardu faces off with Kyoshi Heilman, 2) Opponent thrusts to face of Mr. Heilman who shifts to the outside & forward (to get inside range of bo) to block the bo and strike the kidney at the same time. 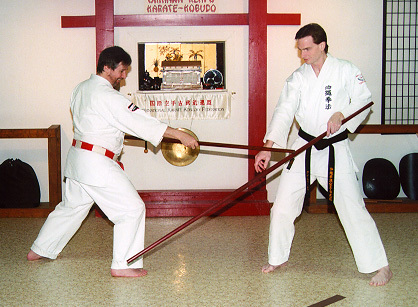 Disarms - Angle Movement - Bo vs. Bo: 1) Kyoshi Heilman faces off with Mr. Moyer, 2) Mr. Moyer attacks with an overhead strike, Kyoshi Heilman shifts to the outside and executed an attack to the lead hand, 3) followed by a stripping of the weapon.